The colder months have traditionally been the most difficult for hospitals. But pressures have grown so much that this summer saw one in 10 patients wait for over four hours in A&E during June, July and August. Only last winter saw a worse performance since the target started in 2004, figures from NHS England showed. During the summer months 90.6% of patients were seen in four hours. Hospitals are meant to deal with 95% in four hours. The data also showed hospitals are missing a number of other key targets for cancer, routine operations and ambulance response times. 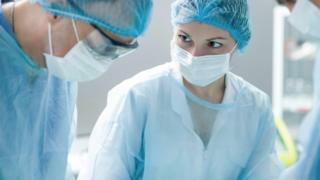 And the delays hospitals experienced in August discharging patients reached a record high. There were over 188,000 days of delays – a 30% rise on the same month the year before. These delays occur when there are no services available in the community to care for frail patients on release. Dr Mark Holland, president of the Society for Acute Medicine, said the figures once again showed the NHS was locked in an “eternal winter”. “The NHS is on its knees and, this winter, areas will implode around the country. There is no reserve left. Safety concerns have been raised about two-thirds of A&E units in England, with inspectors blaming underfunding of council care services for causing overcrowding in hospitals. The Care Quality Commission review said emergency care was one of the poorest-performing parts of the system. It cited safety as a major weakness, with 22 of 184 units rated inadequate and another 95 requiring improvement. Problems it found included overcrowding, delays getting access to vital equipment and resuscitation bays and poor hygiene pratices. But the regulator did not blame the NHS. Instead it said rationing of council care, including access to home help for daily tasks such as washing and dressing and care homes, was pushing more old and frail people into hospital. CQC chief executive David Behan said the council care system had reached “tipping point” and was in the worst state he could remember during his 38-year career in the system. In an unprecedented step for the regulator, he called on ministers to pump more money into the council care system. Mr Behan highlighted figures showing the numbers getting care had fallen by a quarter in the past four years, leaving one million older people with care needs getting no help at all. He refused to say how much extra the care system should get. Just under 8bn a year is spent on services – a fall of 9% in the past five years. But a Department of Health spokeswoman said the health and care sector was “coping well” given the pressures. And she said ministers were already providing extra money to the care sector through the Better Care Fund, which is largely funded by the NHS to encourage joint working between councils and the health service. Local authorities have also been allowed to increase council tax by 2% a year this Parliament to pay for social care – although councils have claimed this is not enough to plug the shortfall in their care budgets because of the wider squeeze on their funding. How much does it cost to be old? When the CQC is particularly concerned about safety or the quality of care it can take enforcement action. This includes fines and closing down services. But it has also been given new powers to prosecute the worst offenders and has had two successful prosecutions to date. In June, St Anne’s Community Services was fined 190,000 following the death of a 62-year-old man who broke his neck in a fall from a shower chair at a nursing home in West Yorkshire in April 2015. Then in September, Coverage Care Services was fined 50,000 and a former manager fined 685 following the death of a resident at Coton Hill House care home in Shrewsbury in February 2015. CQC inspectors found the resident had not been given his medication to prevent blood clots for up to 30 days before he died. 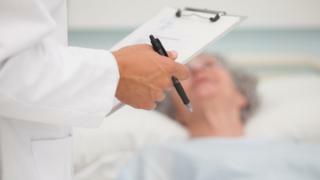 While the CQC expressed concern about the pressures being seen, it also said there were many examples of good care among the 20,000 inspections it had carried out. Despite the cuts to council care services, the help that was being provided in the home and in care homes was rated as good or outstanding in 72% of cases. 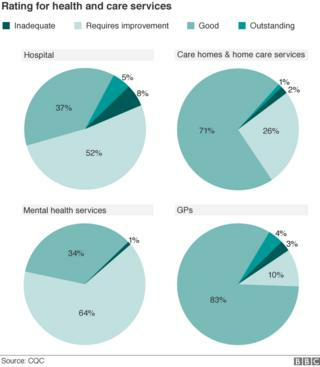 Meanwhile, 87% of GP practices were good and outstanding, as was 42% of hospital care overall. No mental health service was rated as outstanding and just 34% as good. Not every service has yet been inspected, although the vast majority of hospitals and mental health care facilities have – and over half of GP practices and care services have been. Katherine Murphy of the Patients Association said the findings were “sobering”. A year ago, a project – backed by NHS England as part of the vanguard programme – was launched in the London borough of Sutton to get the NHS and the care system to work more closely together. It has seen GPs employed to carry out regular visits to care homes, with each resident now receiving six-monthly check-ups. A pharmacist is on hand to visit homes to carry out medicine reviews. And district nurses have been used to train care home staff in dementia, falls and diabetes. Since the project started a year ago, there has been a 10% drop in visits to A&E. Have you, or someone you know, been in hospital and had your discharge delayed because of a lack of adequate care? Let us know about your experiences. Email haveyoursay@bbc.co.uk with your stories. Next articleChelsea Clinton Pays Tribute To Her ‘Fighter’ Mother Hillary Clinton At The 2016 DNC! WATCH HERE!